For two whole days on October 17 and 18, a group of 30 professionals–doctors, leaders of IWCPI, friends, family members, the crew of ABS-CBN, and other professionals–worked hand-in-hand with local doctors, dentists, teachers and local officials, to provide critical basic services for thousands of residents, school children, and elderly, in three barangays of Lupao, Nueva Ecija. 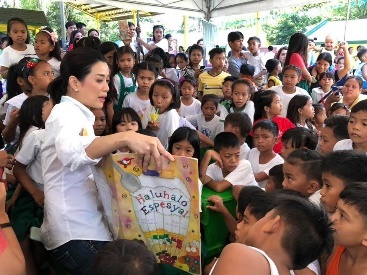 First stop was the San Pedro Elementary School in Brgy. San Pedro where a simple talk was conducted on Oral Hygiene for 180 children, after which the group distributed toothbrushes and toothpaste, and a practice session in tooth-brushing. 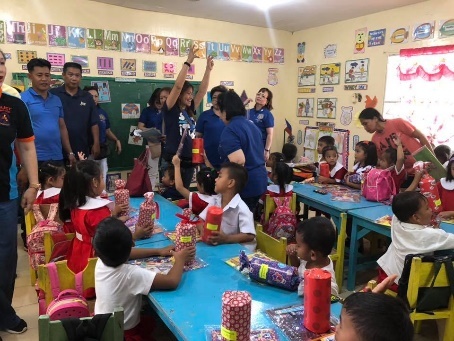 Thirty (30) children were gifted with school books, supplies to nourish their quest for learning, and piggy banks to start them off with saving coins. As if the team had not traveled 5 hours from Manila, they still led a Zumba dance sessions to students, teachers and parents. 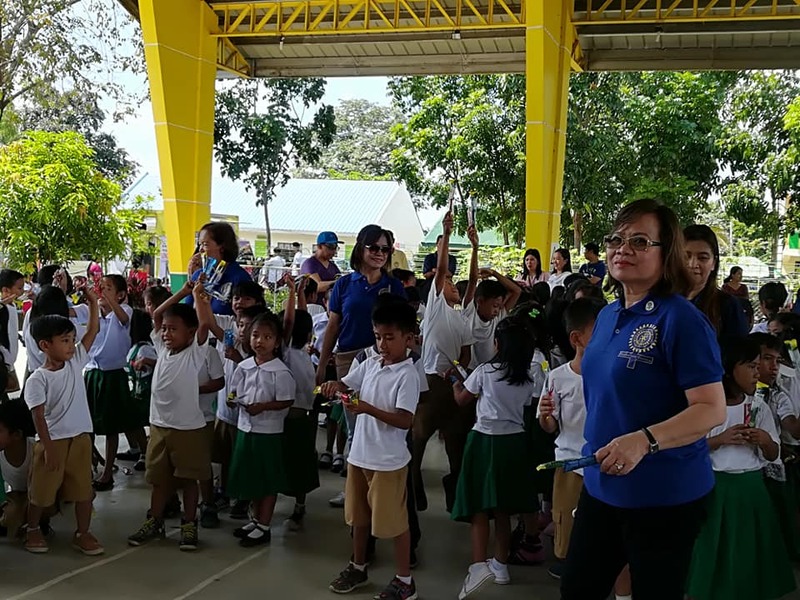 Of course, Inner Wheel leaders, led by NP Donna Jiao and DC Minnie Elizaga showed off their dancing prowess, to the delight of the children and adult residents. 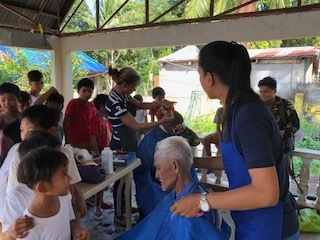 Later in the morning the team visited the nearby barangay of Calcib, where they distributed rice and canned goods for 90 indigent families, stuffed toys for children, soap and lotion for ladies, pots of hot porridge. 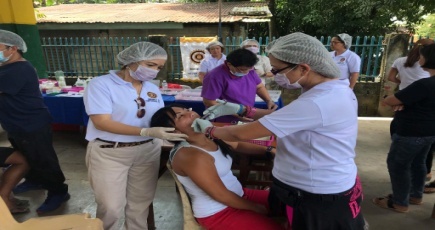 The community greeted the visitors enthusiastically, and treated them with a boodle fight at PInsal Falls, which was yet another opportunity to interact with residents and leaders, and appreciate the natural beauty of the area. 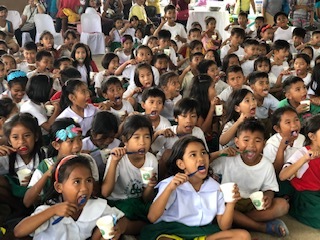 Through partnership with ABS-CBN, the project provided a MOBILE LIBRARY (Teaching, Learning, Caring Van) for the day that allowed kids to read some books. One of the news reporters of ABS CBN, Ms. Bernadette Sembrano, led the story telling activity for the children. Through IWCPI’s District 383 Committee Chair for Women and Children’s Concerns, Ms. Izzy Moore, we discuss the “NO to BULLYING” campaign with all the students providing them basic knowledge of what bullying is all about and what is important about the ability to learn respect and love for self and others. This is a project of IWC Las Pinas & Environs, District 383 led by President Dr. Anna Liza “Analie” Bolinao (IWY 2018-2019) with the support of the following clubs: IWC Makati, IWC Makati North, IWC Muntinlupa Filinvest, IWC Paranaque, IWC San Nicolas Makati. IWC Makati San Antonio and IWC Alabang New Generation. 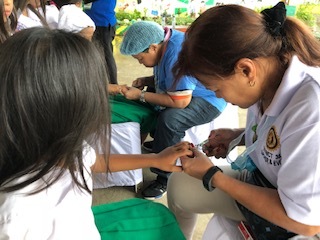 The 2-day Lupao experience culminated in the adoption of the community of Namulandayan, Lupao, Nueva Ecija, through a MOA signed between the Barangay of Namulandayan and IWC Las Pinas & Environs. Part of this adoption of Namulandayan is the commitment to reconstruct a classroom for the children who currently hold lessons in the covered court. All Inner Wheel members who participated in the project– NP Donna Jiao, IPNP Baby Golez, DC Minnie Elizaga, IPDC Nenette Qua, PDC Alice Lucas, PDC Ann Margaret San Antonio, District 383 Officers, Club Officers and members—had left Manila in the very early morning of day 1, slept over in homes of sponsor families–mainly local officials–and arrived back home 2 nights later, will attest the life-changing experiences of this sharing and receiving with the Lupao residents. Everyone not only gained many new experiences and insights, but also new friends from among their colleagues and the Lupao community. It was surely an expression of the Inner Wheel creed: “Selflessness in friendship, and service to humanity.